Today’s post is brought to you by my Mom! Enjoy! So we are nearing the end of week four. To date, I have logged 123 official miles since beginning on June 30. Overall, I would have to say things are going pretty darn well, so here are a few highlights. So far, this is the only place I’ve deviated from the training plan, typically ditching the Tuesday workout in favor of the Good Times Series 5k in Lowell, which you have read about in Nora’s other posts. (In the beginning I would walk a few miles in the morning, but these last few Tuesdays have been so hot and horrible that I’ve even given that up and just try to conserve my strength for the evening’s race.) After not doing any races in this series last year, I’ve come back a bit faster, and aside from my surprising PR of 25:31 on week two, I seem to be settling into running a pretty consistent 26 minutes and a few seconds. There is no race this week, and while I’m grateful for the break, I really want to break that 26 minute barrier at least one more time! Which brings me to probably the biggest challenge so far. Hills!! 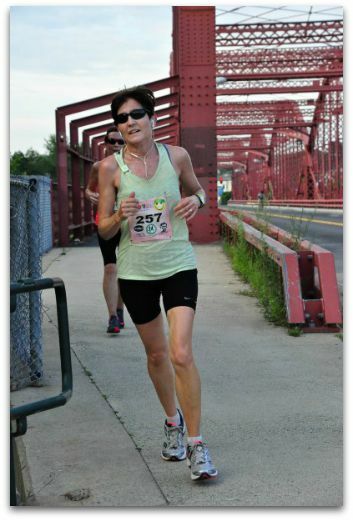 Racing hard on Tuesday night (my new competitive side has really taken over and even in the heat, I want to do my best), followed by a hill workout scheduled the following morning – in exactly the same hot, hazy conditions – has been tough. Still, I seem to be getting a bit more “comfortable being uncomfortable.” I won’t say I am beginning to enjoy the hill workouts, but, I think they have helped my 5k times so I’m determined to keep up (the-hill) the good work. 😉 I bring lots of water, and take a short walk break if I need – but never on the hills. One Mile Time Trial: So, this was a new one for me. I went up Nora’s old junior high school track where it was already 70 degrees at 9 AM. Still, that was cool compared to the race conditions of the night before, so it didn’t feel terrible. As I ran my warm up mile (four times around the track for our non-running readers) at a sluggish 9:30, I played with my GPS watch and figured out how to use the special lap function. With my technology issues, I was almost as proud of this as I was of my speedy mile. It was Run as fast as you can…and oh, yeah, remember to hit the lap key so you can see how you do each lap…1:59, 2:00, 2:00, 1:51…which comes to 7:50! I know this isn’t the fastest mile I have ever run, but it wasn’t bad, and I wanted to make sure I left a little room for improvement. And after I ran my cool down mile, this time ignoring my watch, I was pleased to see I had kept up a pretty nice pace of 8:40. So I walked a victory lap, sipping ginger water! And what am I doing special (or weird) in my training? And I’m reading some great medieval thrillers by Eric Jager, because I was beginning to drive myself crazy reading about running all the time! So stay tuned for more updates on my 5k results, marathon training, and general running adventures! Hope you had a great weekend! Flip flops – yay or nay? Do you have any special/weird habits during marathon training? This entry was posted in Training, Uncategorized and tagged Bay State Marathon, Marathon Training, Running, Thoughts of a Runner. Bookmark the permalink. Great job this month! That’s a lot of miles! Love flip flops but I gave them up for plantar fasciitis (the things we do for running!!) and now wear Birkinstocks!